Friday’s sod-turning on the new Military Vehicle Centre of Excellence (MILVEHCOE) marks a milestone for the Australian Army and the nation’s developing defence industry. Defence Minister Christopher Pyne said he was pleased to see the ongoing development of Australia’s defence industry sector, and the key next step in the over $5 billion LAND 400 Combat Reconnaissance Vehicle program. Located in the Ipswich on the outskirts of Brisbane, the new centre is a vote of confidence in Australian industry. 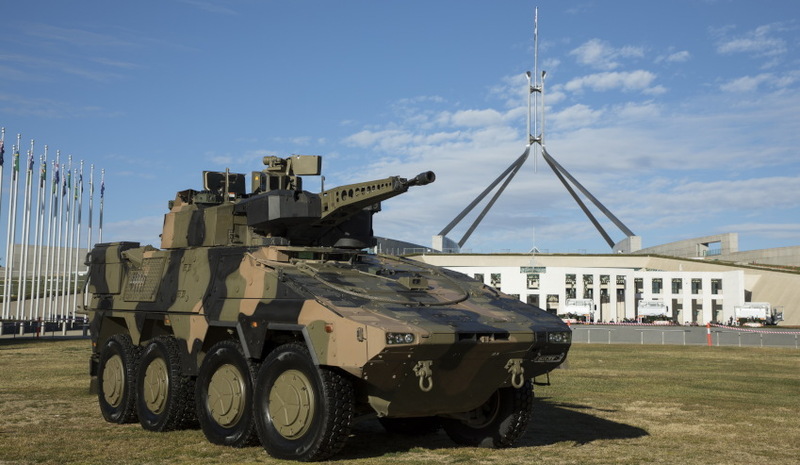 The Ipswich facility will be home to the production line for the Boxer 8x8 CRV, which is being delivered under Defence’s $5.2 billion LAND 400 Phase 2 project. "This is a nation-building effort involving 1,450 jobs across Australia for our newest armoured vehicles alone and reinforces the federal government’s drive to support the workforce behind the Defence Force," Minister Pyne explained. Car parking for employees and visitors, vehicle storage, refuelling and wash-down bays, water storage tanks, waste and recycling facilities. The workforce that will deliver the Boxer vehicles will continue to be used to support sustainment, progressive development and upgrades, as well as potential export opportunities. Defence Industry Minister Steven Ciobo highlighted the role of MILVEHCOE in establishing a viable advanced manufacturing sector in Queensland. "These are the jobs of the future – working on highly advanced military vehicles with advanced complex systems," Minister Ciobo said. The Boxer vehicles replace the ASLAVs (Australian Light Armoured Vehicle), which are more than 20 years old, and will ensure Australian soldiers have the best possible chance of completing their missions successfully and returning home safe to their families. "The LAND 400 Phase 2 project is being used as an exemplar in Defence to highlight the mutual benefits resulting from Defence and industry working together for a better outcome. Working together, the two entities were able to significantly raise the Australian industry content for the project," Minister Pyne said when signing the LAND 400 Phase 2 contract.